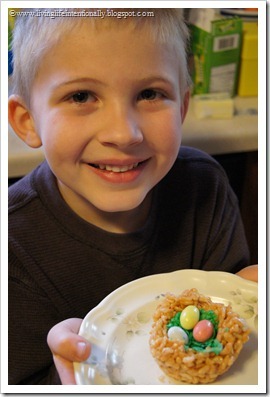 Super cute kids spring snack that is easy to make and fun to eat. 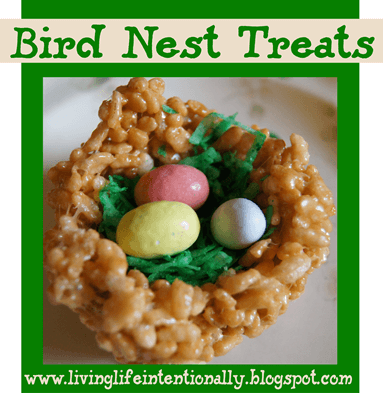 Whether you make them for Easter, Spring, or as part of a bird week, Bird Nest Treats are a super simple, fun treat. In a large pot over low heat melt 4 TAB butter (you don’t want to burn the butter!). Add 4 cups mini marshmallow (or 40 large) to butter over medium heat, stirring constantly. 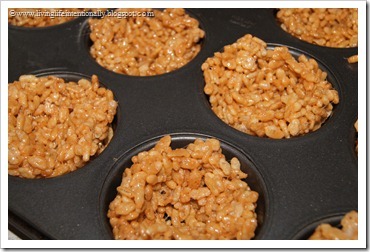 Scope treat into muffin tins (no need to spray). Use spoon or fingers to push down the center and push up the sides to create a nest. While treats “set” put coconut & a little green food coloring in a plastic bag & mix. This is a favorite treat in our house!